The Curry’s feature talks intimately about the founding of Curry’s and Grill in March of 2018 and their initial success and motivation to expand awareness of their exceptional Pakistani food offerings in London. The owners Ghousia and Tehmina Khan are candid about the student clientele and the influence of smartphone use and social media on their demographic. It was a natural progression for these ambitious owners to reach out to SlyFox for advice on social media management which eventually lead to a successful business relationship that extended their reach and impressions on all target platforms. Take a look at some of the article highlights or read it in full here. We do targeted hashtag research, with the goal of avoiding Instagram hashtag‘ghosting’(not being visible to people who do not already follow you when searching for a hashtag),” Faulds says.“Comments and engagement with Londoners on Currys & Grill’s behalf enable Ghousia to run her business yet still remain actively engaged with her target market.” Specials are posted daily by SlyFox on the restaurant’s social media sites. 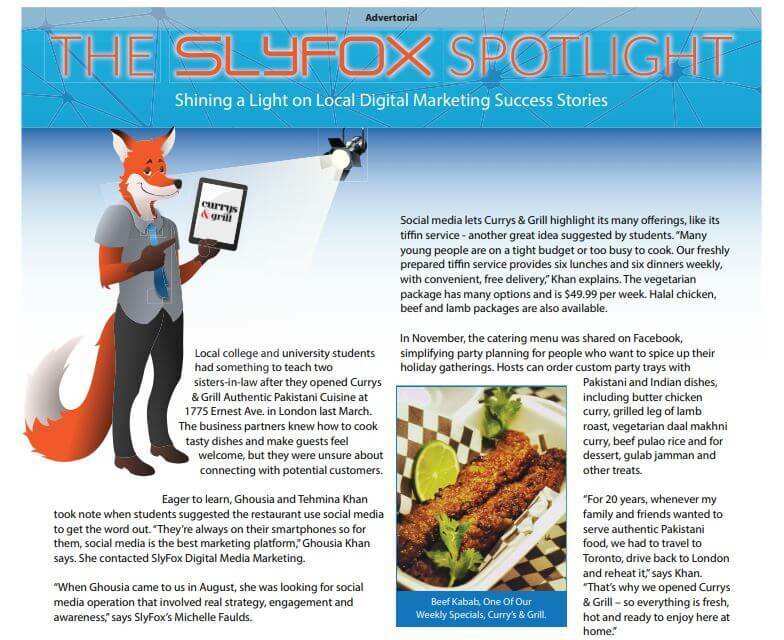 Facebook reach has increased from 80 per post to 1,500 per post.” Social media lets Currys & Grill highlight its many offerings, like its tiffin service – another great idea suggested by students.“Many young people are on a tight budget or too busy to cook.